Night Guard for 1/2 price! Do you grind your teeth at night? Do you have frequent headaches in the morning? Does your jaw feel tight or sore? You may need a night guard! Have you been told by a previous dentist that you need a night guard, but you just couldn’t afford it? 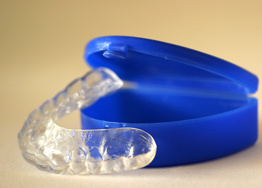 Alpha Dental is offering a custom-fitted night guard for a price you cannot beat! Hurry in, because we’re offering a limited number of night guards during this promotional period. Lets face it... Most of us can't afford to ski the slopes of Aspen. The money we have helps with important issues such as bills, our health and putting gas in the tank. At Alpha Dental we'll show you how dental works at a price you can afford. Our highly trained staff turn small smiles into BIG SMILES everyday. We're smile makers and problem preventers. Let us lead you to the care you deserve. Still have questions? Call Cher at 614-787-5224 for more information! Click the button below to add the Night Guard to your wish list.